2 new layouts to share today, both of Adah’s. I am beginning to think that its easier to do girls’ layouts than boys’. At least I can add flowers and butterflies without worrying that its too girlish cos it’s meant to be for girls anyway. People has always been telling me how big Adah’s eyes are. I dun really think so myself but her eyes were the first part of her that left an impression on me when I first saw her after she was born. The nurse had cleaned her up and placed her on my chest after she was delivered and this small squirmy, whiny baby appeared very alert to me cos I met her eyes and she was wide awake! Nothing like Asher, whom I had diffculties making out how he really looked like cos his eyes were so small and he barely could keep them open the first few days! Lols. The photos in the layout were that of Adah’s in her sleepy state around 3 months old. The challenge for Butterfly Crafts was simple, just to use your favourite color. Mine has to be pink. Its easy to combine with other colors- even browns for earth tones and a vintage look and if its bright fuschia pink, it brightens up the page immediately and these days, its not that strange to find pink on boys/ men. I used a transparency overlay from Fancy Pants here and I cut 2 other pictures of Adah’s to fit into the circles. Overall, I loved the effects and the embellishments used. I used another glitter Fancy Pants transparency here and followed the sketch #134 provided by Pencil Lines. The blue borded was actually cut out from one of my favourite Sassafras Lass papers and I loved the green damasak paper which I had used as the background. Its from Daisy D and has been in my stash for the longest time. Its one of those papers which I just can’t bear to use because its so lovely but when I saw the main picture of Adah in the pool, I knew the paper was an immedite match. I love this picture so much, I think I might just scrap it again some other day. I hate it that the governement here has blocked Blogger and almost all blogsites. Dun ask me why, I really dunno why??? Now I will have to find some means to get my site updated, maybe my sis when she is not too emo, or via some proxy network which means we will have to pay for its use. But the happy news- I made it to the Design Team of Butterfly-Crafts. Yay!!! Thank you Karen for choosing me, I am sooo excited that I can’t wait for the term to start. I’m sure I will have more photos to scrap afer our trip to Tokyo next weekend! Yes, we are still going despite the swine flu. We just pray hard, wash hands more regularly and faithfully carry our sanitiser solutions and wet wipes all the time. And I hope by the time my term starts, blogger sites will be unblocked again!!! These are my fellow team mates over at Butterfly-Crafts.blogspot.com. Do visit us! I used the sketch #82 from Got Sketch? This is Asher at 3 months old, still a contented and chubby baby, starting to coo more and get more active. The internet is indeed a powerful tool. Through it, I get to research about information I need (sometimes too much info till it scares me), but there’s online classes, online ordering (my favourite!) and blog- hopping, getting to learn more about this hobby of mine and making new SB friends thru’ the internet. And Annissa is a life saver. She is so so good with her dollars and cents that I can just turn to her to check out where’s the best place to get stuff and sometimes I ride on her sprees and save more . I am thankful for this hobby which helps me to relieve stress, keeps me sane and has engaged me in forming new relationships which I never expected to have. love that owl!!! you’ve been busy!! Hoooooooot!!! That’s a cute layout! Love the owl cut-out! Hey! We must must really meet-up when you get back from Shanghai! Hope to be able to crop with you before my house is sold off! All of 2 months- Adah grew so much in just a matter of 2 months that I could hardly recognise the scrawny, dark and skinny baby that we brought home from the hospital It was a challenge adjusting after the confinement lady has left but we DID it! Even now, I can recall vividly the long nights when I had to carry and rock a colicky Adah and walk her up and down the corridor. Those nights seemed so endless then… But now 4.5 years seemed to have just gone by in a flash…it’s so scaryhow fast the kids just seem to grow up overnight. 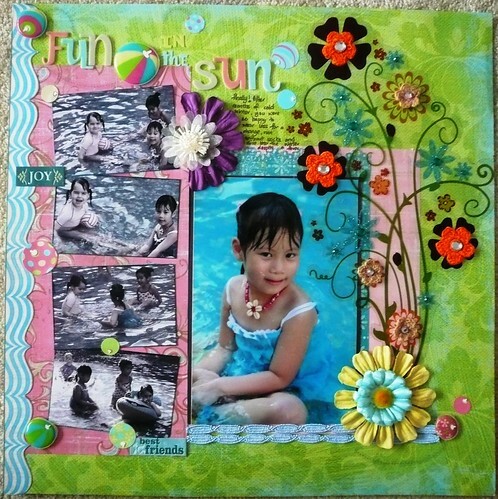 I used the layout provided in Challenge #122 over at Lotus Paperie. I have this habit of trying to squeeze in as many pictures into a layout as possible. I thought this layout was appropirate as I wanted to show the many faces of Adah in her first 2 months. I used lots of stuff from my old stash here. Nothing is new except the paper from Imaginisce which was used as the background. Even teh flower sheers from KI memories had been lying in my cupboard for some time! I am glad that I am using up stuff. Perhaps that means I can purchase more soon!!! I am trying to catch up on my two first year albums so that I can start scrappin’ the more current photos and I always like to capture both Adah and Asher together on the camera. They are so funny, always looking out for each other to play with and yet they quarrel like almost every 10 minutes. There is hardly a moment of peace when the two of them are awake. Even when Adah is quietly reading on doing her own stuff, Asher will find some way to irritate or taunt her. © 2019 Little Blessings of Mine|ProPhoto Photo Website by NetRivet, Inc.